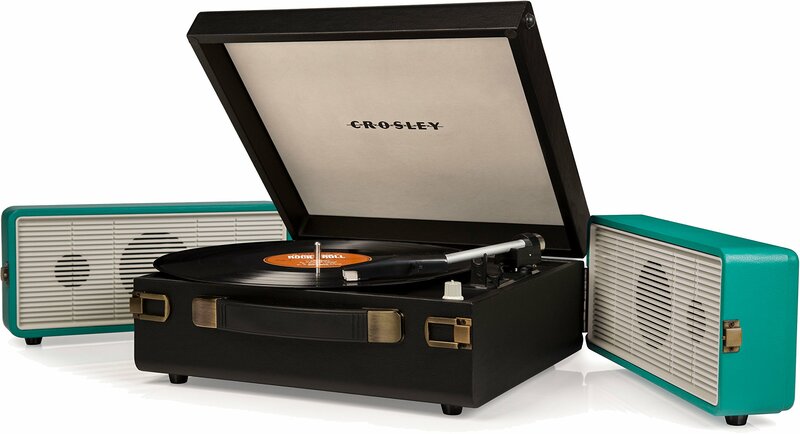 Home › Best-Sellers › Crosley Cr6230A-Tu Snap Portable Usb Turntable With Software For Ripping & Ed..
Color: Black/Turqoise With Crosley's Snap Turntable, modular design and modern sound form theperfect partnership. New to the Crosley portable family, this turntable has ahost of incredible features. The Snap's unique design features a pair of fold-out speakers, allowing you to crank your favorite records without the tangledmess of cords or pesky speaker vibrations. Equipped to play all 3 speeds ofvinyl and outfitted with an auxiliary input, the Snap also bridges the gapbetween digital and analog through its included USB port, allowing you tocreate MP3s of your favorite records.